Though he’s traversed a number of musical styles—and given his public image a number of self-imposed wounds—over the years, his six-string skill has rarely been in question. It’s funny to think about it now, but there was a time not too long ago when—if you had told certain six-string aficionados that you were making a list of John Mayer’s 10 best guitar moments—you would’ve gotten more than a few hairy eyeballs. Mayer though, has long since outgrown his original image as an acoustic-wielding, pop pretty boy from Connecticut and grown into a well-respected guitar veteran. Though he’s traversed a number of musical styles—and given his public image a number of self-imposed wounds—over the years, his six-string skill has rarely been in question. 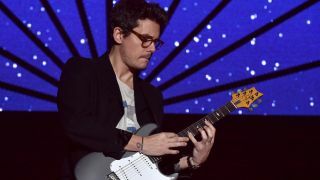 From some of his earliest hits to some of his most recent live work with Dead & Company, here are 10 of John Mayer’s best guitar moments. Though Mayer later became known for his smooth, heavily Clapton-indebted style, he’s always been equally as comfortable unplugged. This, one of his first major hits, shows his efficient acoustic style. His strumming manages to be both breezy and punchy, working in perfect tandem with the vocal harmonies that launched this song onto pop radio, and Mayer into the public eye. Always one of Mayer’s more overlooked early tunes, “Something’s Missing”—taken from his more assured sophomore effort, Heavier Things—has some of the most quietly dazzling playing of this period of his career. It’s hard not to covet the amazing tone he gets in the intro, or the suppleness of his playing in the verses. Perhaps knowing the song wouldn’t be a single, Mayer really pushes himself on this track, and it shows. Even for those who noted Mayer’s evolution between his freshman and sophomore releases, his next move came as a surprise. In 2005, Mayer teamed up with bassist Pino Palladino and drummer Steve Jordan to form the John Mayer Trio. The group’s first release was Try!, an honest-to-god power trio, live blues album, brimming with lengthy exercises in fretwork from Mayer. “Gravity”—a song that would later appear on his next studio album, Contiuum—was the cream of the crop on Try!, perhaps the first time we all saw the full extent of Mayer’s talent both as a guitarist and pop songwriter. Anyone still skeptical of Mayer’s skill going into Try! likely had their heads turned upside down by the album’s fierce version of Jimi Hendrix’s “Wait Until Tomorrow.” Mayer’s final solo on this recording is truly something to behold. Though it never left the same mark as Contiuum’s first single, the ubiquitous, Grammy-winning “Waiting on the World to Change,” “Belief” has some of Contiuum’s sturdiest playing. With its light, bluesy shuffle, you get the sense that Mayer is in full control; not just as a player, but a band leader. Would it be too on-the-nose to call this a “slow burner”? Maybe, but to do so would be calling the song for what it is, a perfectly measured and executed ballad. Mayer’s playing hogs all the attention here. He manages to keep the song suspended seemingly in mid-air, while still offering subtle responses to his vocals. This fun collaboration is simply a joy to watch. Guy—an undisputed master of the blues—is clearly impressed with Mayer, who engages in some flashiness, while still paying his respect to Guy. He plays off of the blues legend, rather than trying to one-up him with his solos; a true celebration of the power of the blues. Buddy Guy isn’t the only legendary guitarist to sing Mayer’s praises. None other than Eric Clapton has referred to Mayer as a “master” guitarist. Their mutual love of the blues, and their shared penchant for smooth, melodic leads make them a natural collaborative fit, as this searing performance of “Crossroads” demonstrates. Mayer’s debt to Hendrix is obvious throughout his work. Unlike his earlier cover of “Wait Until Tomorrow”—which lashes out with the force of a musician who felt he had something to prove—this cover feels smoother, the interpretation of an artist who had matured, and no longer needed to dazzle. When Mayer was welcomed into the Grateful Dead fold as part of the offshoot group, Dead & Company, many Deadheads were skeptical. It didn’t take long for Mayer to win them over though, showing fans that he could capably emulate Jerry Garcia’s versatile playing and smooth vocals. This performance, taken from one of the band’s first concerts, shows just how quickly Mayer gelled with the group.